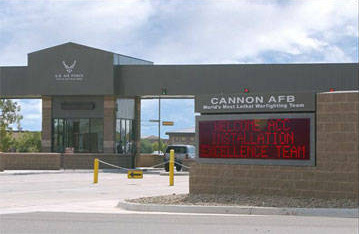 Alliance Safety LLC provided safety management support for this project at Cannon Air Force Base in New Mexico. This project consisted of expanding the existing wastewater treatment plant to handle a capacity of one million gallons per day, with construction of a new 250 thousand gallon (KG) aerobic digester, and the conversion of existing aerobic digester into a sequencing batch reactor (SBR). In addition, upgrades were made to other support devices and equipment in the treatment plant. Cannon Air Force Base has more than 50 years of continuous service. Cannon is the home of the 27th Special Operations Wing, which activated on October 1, 2007. The 27 SOW has a primary mission to plan and execute specialized and contingency operations using advanced aircraft, tactics and air refueling techniques to infiltrate, ex-filtrate and resupply special operations forces worldwide and provide intelligence, surveillance and reconnaissance and close air support in support of SOF operations.